How many times have you heard these statistics? •	The total number of branches in the US has only dropped 6% (6,300) from peaking at nearly 100,000 in 2009. •	Cost per transaction at the branch is nearly $4 vs. $0.59 at the ATM and dropping even further online and using the mobile channel. 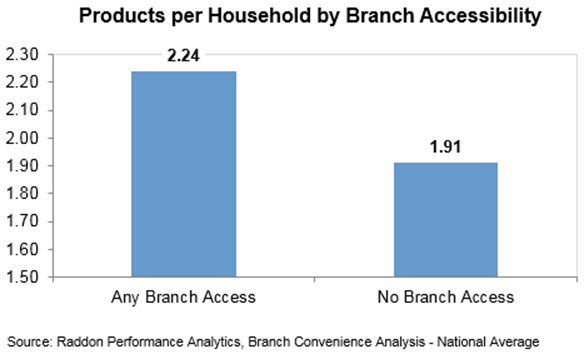 •	Customer utilization of the branch is declining (about 85% of all bank transactions are not done at the branch; 36% of customers haven’t visited the branch over 6 months). •	Customer loyalty is greater using other channels (47% of 18-35 year olds are willing to change banks based upon their mobile app). 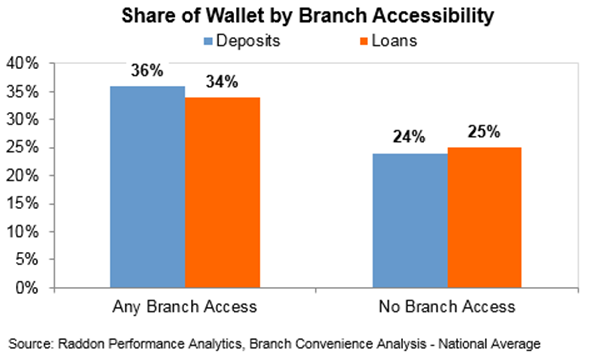 •	Banks with branches have a 36% better share-of-wallet than those with branches based upon Raddon Research. •	73% of checking account openings occur at the branch. •	Branches are one of the few channels left where community bank differentiation is possible and not prohibitively expensive. •	My perspective: Service is exceedingly difficult to use as a differentiation tool. Most community banks claim service is the cornerstone of their differentiation strategy. I’m afraid it only works AFTER a customer has been acquired and has had a meaningful experience with the bank – or as a referral tool. We all claim our service is world class, but only few can substantiate that claim. What you will be hearing in 2017-2018 is that deposits are rising in value, not only because of their impact on cost of funds but also due to their impact on valuations. Banks with COF (cost of funds) under 25bp enjoy valuations (percent of Tangible Book Value) that are 37% higher than those whose cost of funds is over 75bp. This is critically important to community banks, acquirers (due to improved currency value) and the acquired alike. The common wisdom is that as rates rise and the yield curve steepens so will the value of deposits and, with it, the branches and the entire retail franchise. I agree, and believe that thoughtful management teams will act today on the implications of the anticipated renewed quest for deposits. Retail Banking is a retail business. Its sales outlets are its lifeline. Yet, the number of stores closings for other retailers has surged dramatically to 2,087 1Q17 (per Morgan Stanley research as of March 29, 2017) and 9 retail chains filed for bankruptcy in the first quarter (CNBC). It appears that the brick-and-mortar retailing industry is in a low-motion train wreck, and that their online competitors are flourishing. Have you tried the “Subscribe and Save” feature on Amazon? Or its wifi product reorder buttons? You should. The importance of branches varies by market and by bank. For example: banks that are committed to more technology spend can make more dramatic changes than those that don’t. Bicoastal banks must make more rapid changes. A universal truth is – we can’t continue the way we are today and expect to be here five years’ hence. I expect that large branch networks will turn from an asset to prospective buyers to a liability overnight sometime during this planning horizon, as customers’ defection with branch closures will slow meaningfully. •	Doing nothing has a significant associated cost – not just in terms of current operating costs but also in terms of future valuations. •	Marginal adjustments are as agonizing as meaningful ones. •	Our boards do not represent a cross-section of our customers. •	We focus too much on the look and square footage of the future branch and too little on the holistic distribution strategy. While determining technical aspects of the branch of the future is critical, we first need to determine the path itself – specifically, where we are going with our branches. This is especially difficult because our ultimate goal – to turn them into consultative sales centers – is temporarily hindered by the Wells scandal. Customer acquisition and sales are the lifeline of any retailing organization, and incentives are the fuel that energizes the team to fully take care of our customers. Both are questioned and limited by the current over-reaction to Wells Fargo’s activities. The message remains clear: it’s all about the culture and the overarching distribution strategy. The branch dilemma is really not about the branch but about the best distribution mix of physical, web-based and mobile-based channel offerings to your specific customer base. Your distribution strategy will shape your branches and the relative investment in them vs. other channels. Just don’t want too long. This train is leaving the station.